It’s December now, and my garden looks brown and bare–nothing like the picture above. But I just found this on my camera, and wanted to share it so we’d have something colorful to look at during this kinda dreary season. I saw these morning glories earlier this year, growing on trellises at the John C. Campbell Folk School in Brasstown, N.C. If there was a sign showing the variety name, I missed it. But aren’t they glorious? 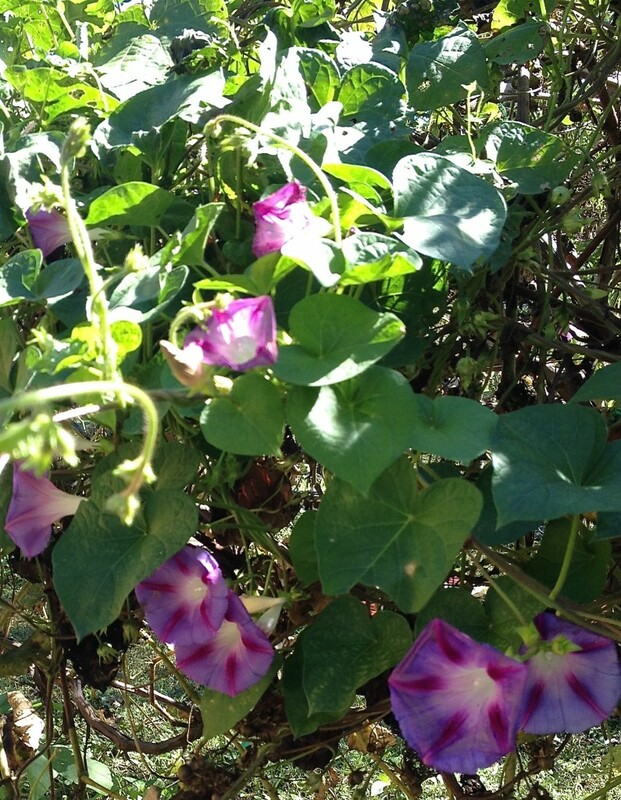 Morning glories can be really weedy, of course, and take over your yard or garden spot. I made the mistake once of composting some vines, and the next spring–in fact, for many springs thereafter–I had to pull up seedlings that sprouted everywhere. Now I know it’s better to trash or burn the vines at season’s end (if burning is permitted in your area). You just can’t tell if a few dried seed pods are still clinging to the plants, and believe me, they’ll grow almost anywhere you toss them. This summery picture will have to hold me for now. If anyone can tell me what variety these might be, please let me know. I’m wondering if they’re open-pollinated/heirlooms.